Power transformer, 120VAC step-down to 12VAC, with center-tapped secondary winding (Radio Shack catalog # 273-1365, 273-1352, or 273-1511). Terminal strip with at least three terminals. Household wall-socket power plug and cord. Fuse and fuse holder (optional). Power transformers may be obtained from old radios, which can usually be obtained from a thrift store for a few dollars (or less!). The radio would also provide the power cord and plug necessary for this project. Line cord switches may be obtained from a hardware store. If you want to be absolutely sure what kind of transformer you're getting, though, you should purchase one from an electronics supply store. If you decide to equip your power supply with a fuse, be sure to get a slow-acting, or slow-blow fuse. Transformers may draw high "surge" currents when initially connected to an AC source, and these transient currents will blow a fast-acting fuse. Determine the proper current rating of the fuse by dividing the transformer's "VA" rating by 120 volts: in other words, calculate the full allowable primary winding current and size the fuse accordingly. Lessons In Electric Circuits, Volume 2, chapter 1: "Basic AC Theory"
Safe wiring techniques for power cords. Warning! This project involves the use of dangerous voltages. You must make sure all high-voltage (120 volt household power) conductors are safely insulated from accidental contact. 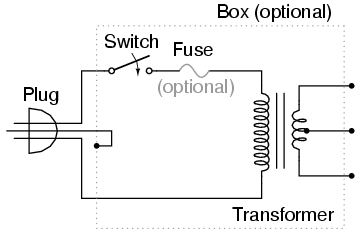 No bare wires should be seen anywhere on the "primary" side of the transformer circuit. Be sure to solder all wire connections so that they're secure, and use real electrical tape (not duct tape, scotch tape, packing tape, or any other kind!) to insulate your soldered connections. 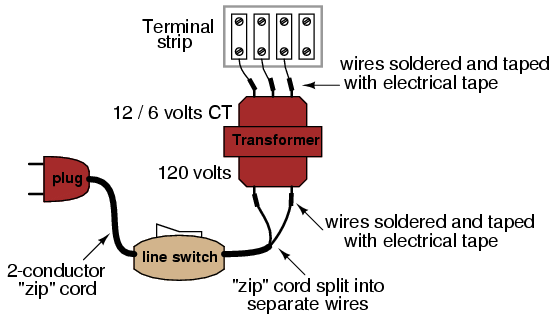 If you wish to enclose the transformer inside of a box, you may use an electrical "junction" box, obtained from a hardware store or electrical supply house. If the enclosure used is metal rather than plastic, a three-prong plug should be used, with the "ground" prong (the longest one on the plug) connected directly to the metal case for maximum safety. Before plugging the plug into a wall socket, do a safety check with an ohmmeter. With the line switch in the "on" position, measure resistance between either plug prong and the transformer case. There should be infinite (maximum) resistance. If the meter registers continuity (some resistance value less than infinity), then you have a "short" between one of the power conductors and the case, which is dangerous! Next, check the transformer windings themselves for continuity. With the line switch in the "on" position, there should be a small amount of resistance between the two plug prongs. When the switch is turned "off," the resistance indication should increase to infinity (open circuit -- no continuity). Measure resistance between pairs of wires on the secondary side. These secondary windings should register much lower resistances than the primary. Why is this? Plug the cord into a wall socket and turn the switch on. You should be able to measure AC voltage at the secondary side of the transformer, between pairs of terminals. Between two of these terminals, you should measure about 12 volts. Between either of these two terminals and the third terminal, you should measure half that. This third wire is the "center-tap" wire of the secondary winding. Lessons In Electric Circuits, Volume 1, chapter 15: "Inductors"
Lessons In Electric Circuits, Volume 2, chapter 3: "Reactance and Impedance -- Inductive"
Effects of magnetic permeability on inductance. How inductive reactance can control current in an AC circuit. Wrap hundreds of turns of magnet wire around the paper tube. Connect this home-made inductor in series with an AC power supply and lamp to form a circuit. When the tube is empty, the lamp should glow brightly. When the steel bar is inserted in the tube, the lamp dims from increased inductance (L) and consequently increased inductive reactance (XL). Try using bars of different materials, such as copper and stainless steel, if available. Not all metals have the same effect, due to differences in magnetic permeability. This experiment is identical in construction to the "Sensitive Voltage Detector" described in the DC experiments chapter. If you've already built this detector, you may skip this experiment. Solder all wire connections well. This detector system is extremely sensitive, and any loose wire connections in the circuit will add unwanted noise to the sounds produced by the measured voltage signal. 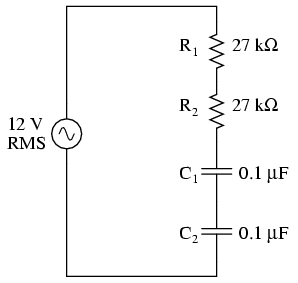 The two diodes connected in parallel with the transformer's primary winding, along with the series-connected 1 kΩ resistor, work together to "clip" the input voltage to a maximum of about 0.7 volts. 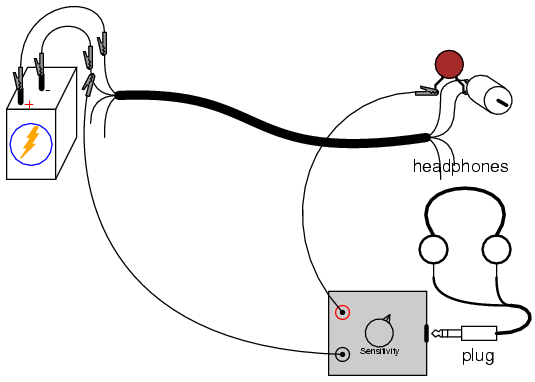 This does one thing and one thing only: limit the amount of sound the headphones can produce. The system will work without the diodes and resistor in place, but there will be no limit to sound volume in the circuit, and the resulting sound caused by accidently connecting the test leads across a substantial voltage source (like a battery) can be deafening! Adjust the 100 kΩ voltage divider potentiometer to about mid-range when initially sensing a voltage signal of unknown magnitude. If the sound is too loud, turn the potentiometer down and try again. If too soft, turn it up and try again. This detector even senses DC and radio-frequency signals (frequencies below and above the audio range, respectively), a "click" being heard whenever the test leads make or break contact with the source under test. With my cheap headphones, I've been able to detect currents of less than 1/10 of a microamp (< 0.1 µA) DC, and similarly low-magnitude RF signals up to 2 MHz. 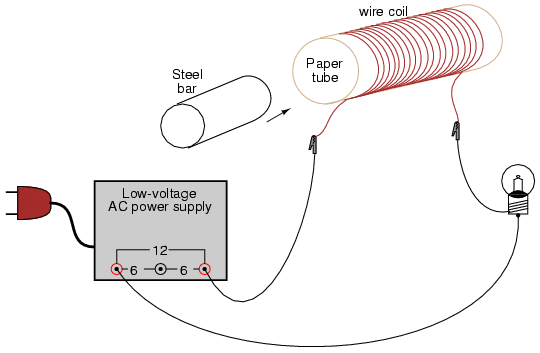 What is needed for an electromagnet coil is a coil with many turns of wire, so as to produce the most voltage possible from induction with stray magnetic fields. The coil taken from an old relay or solenoid works well for this purpose. 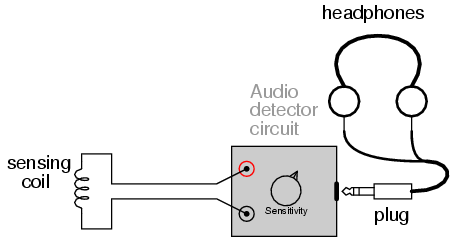 Using the audio detector circuit explained earlier to detect AC voltage in the audio frequencies, a coil of wire may serve as sensor of AC magnetic fields. The voltages produced by the coil will be quite small, so it is advisable to adjust the detector's sensitivity control to "maximum." There are many sources of AC magnetic fields to be found in the average home. Try, for instance, holding the coil close to a television screen or circuit-breaker box. The coil's orientation is every bit as important as its proximity to the source, as you will soon discover on your own! 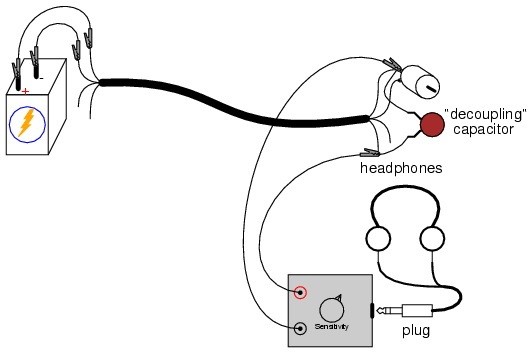 If you want to listen to more interesting tones, try holding the coil close to the motherboard of an operating computer (be careful not to "short" any connections together on the computer's circuit board with any exposed metal parts on the sensing coil! ), or to its hard drive while a read/write operation is taking place. One very strong source of AC magnetic fields is the home-made transformer project described earlier. Try experimenting with various degrees of "coupling" between the coils (the steel bars tightly fastened together, versus loosely fastened, versus dismantled). 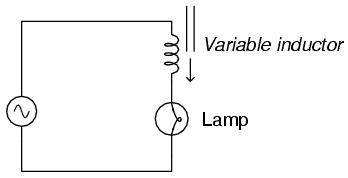 Another source is the variable inductor and lamp circuit described in another section of this chapter. Note that physical contact with a magnetic field source is unnecessary: magnetic fields extend through space quite easily. You may also want to try "shielding" the coil from a strong source using various materials. Try aluminum foil, paper, sheet steel, plastic, or whatever other materials you can think of. What materials work best? Why? What angles (orientations) of coil position minimize magnetic coupling (result in a minimum of detected signal)? What does this tell us regarding inductor positioning if inter-circuit interference from other inductors is a bad thing? Whether or not stray magnetic fields like these pose any health hazard to the human body is a hotly debated subject. One thing is clear: in today's modern society, low-level magnetic fields of all frequencies are easy to find! Effects of electrostatic (capacitive) coupling. "Ground" one lead of the detector to a metal object in contact with the earth (dirt). Most any water pipe or faucet in a house will suffice. Take the other lead and hold it close to an electrical appliance or lamp fixture. Do not try to make contact with the appliance or with any conductors within! Any AC electric fields produced by the appliance will be heard in the headphones as a buzzing tone. Try holding the wire in different positions next to a good, strong source of electric fields. Try using a piece of aluminum foil clipped to the wire's end to maximize capacitance (and therefore its ability to intercept an electric field). Try using different types of material to "shield" the wire from an electric field source. What material(s) work best? How does this compare with the AC magnetic field experiment? As with magnetic fields, there is controversy whether or not stray electric fields like these pose any health hazard to the human body. Old alternators may be obtained for low prices at automobile wrecking yards. Many yards have alternators already removed from the automobile, for your convenience. I do not recommend paying full price for a new alternator, as used units cost far less money and function just as well for the purposes of this experiment. I highly recommend using a Delco-Remy brand of alternator. This is the type used on General Motors (GMC, Chevrolet, Cadillac, Buick, Oldsmobile) vehicles. One particular model has been produced by Delco-Remy since the early 1960's with little design change. It is a very common unit to locate in a wrecking yard, and very easy to work with. If you obtain two alternators, you may use one as a generator and the other as a motor. The steps needed to prepare an alternator as a three-phase generator and as a three-phase motor are the same. 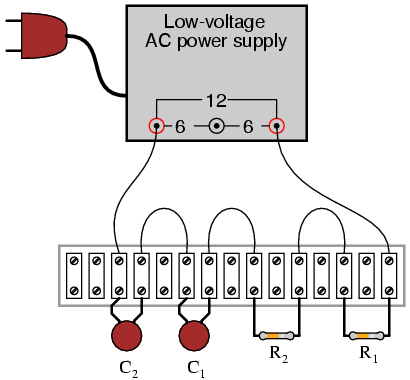 Lessons In Electric Circuits, Volume 2, chapter 10: "Polyphase AC Circuits"
An automotive alternator is a three-phase generator with a built-in rectifier circuit consisting of six diodes. 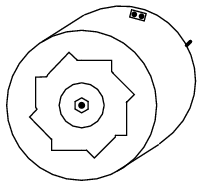 As the sheave (most people call it a "pulley") is rotated by a belt connected to the automobile engine's crankshaft, a magnet is spun past a stationary set of three-phase windings (called the stator), usually connected in a Y configuration. The spinning magnet is actually an electromagnet, not a permanent magnet. Alternators are designed this way so that the magnetic field strength can be controlled, in order that output voltage may be controlled independently of rotor speed. This rotor magnet coil (called the field coil, or simply field) is energized by battery power, so that it takes a small amount of electrical power input to the alternator to get it to generate a lot of output power. Electrical power is conducted to the rotating field coil through a pair of copper "slip rings" mounted concentrically on the shaft, contacted by stationary carbon "brushes." The brushes are held in firm contact with the slip rings by spring pressure. Many modern alternators are equipped with built-in "regulator" circuits that automatically switch battery power on and off to the rotor coil to regulate output voltage. This circuit, if present in the alternator you choose for the experiment, is unnecessary and will only impede your study if left in place. Feel free to "surgically remove" it, just make sure you leave access to the brush terminals so that you can power the field coil with the alternator fully assembled. First, consult an automotive repair manual on the specific details of your alternator. The documentation provided in the book you're reading now is as general as possible to accommodate different brands of alternators. You may need more specific information, and a service manual is the best place to obtain it. 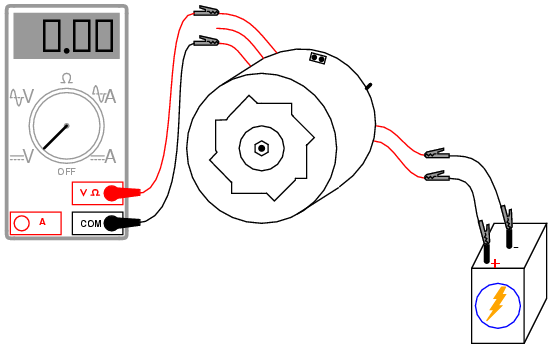 For this experiment, you'll be connecting wires to the coils inside the alternator and extending them outside the alternator case, for easy connection to test equipment and circuits. Unfortunately, the connection terminals provided by the manufacturer won't suit our needs here, so you need to make your own connections. Disassemble the unit and locate terminals for connecting to the two carbon brushes. Solder a pair of wires to these terminals (at least 20 gauge in size) and extend these wires through vent holes in the alternator case, making sure they won't get snagged on the spinning rotor when the alternator is re-assembled and used. Locate the three-phase line connections coming from the stator windings and connect wires to them as well, extending these wires outside the alternator case through some vent holes. Use the largest gauge wire that is convenient to work with for these wires, as they may be carrying substantial current. As with the field wires, route them in such a way that the rotor will turn freely with the alternator reassembled. The stator winding line terminals are easy to locate: the three of them connect to three terminals on the diode assembly, usually with "ring-lug" terminals soldered to the ends of the wires. I recommend that you solder ring-lug terminals to your wires, and attach them underneath the terminal nuts along with the stator wire ends, so that each diode block terminal is securing two ring lugs. Re-assemble the alternator, taking care to secure the carbon brushes in a retracted position so that the rotor doesn't damage them upon re-insertion. On Delco-Remy alternators, a small hole is provided on the back case half, and also at the front of the brush holder assembly, through which a paper clip or thin-gauge wire may be inserted to hold the brushes back against their spring pressure. Consult the service manual for more details on alternator assembly. When the alternator has been assembled, try spinning the shaft and listen for any sounds indicative of colliding parts or snagged wires. If there is any such trouble, take it apart again and correct whatever is wrong. 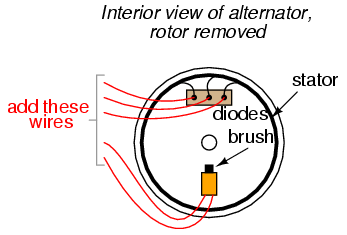 With the multimeter set to the "DC volts" function, slowly rotate the alternator shaft. The voltmeter reading should alternate between positive and negative as the shaft it turned: a demonstration of very slow alternating voltage (AC voltage) being generated. If this test is successful, switch the multimeter to the "AC volts" setting and try again. Try spinning the shaft slow and fast, comparing voltmeter readings between the two conditions. Short-circuit any two of the three-phase line wires and try spinning the alternator. 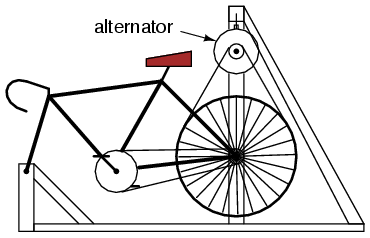 What you should notice is that the alternator shaft becomes more difficult to spin. The heavy electrical load you've created via the short circuit causes a heavy mechanical load on the alternator, as mechanical energy is converted into electrical energy. Now, try connecting 12 volts DC to the field wires. Repeat the DC voltmeter, AC voltmeter, and short-circuit tests described above. What difference(s) do you notice? Find some sort of polarity-insensitive 6 or 12 volts loads, such as small incandescent lamps, and connect them to the three-phase line wires. Wrap a thin rope or heavy string around the groove of the sheave ("pulley") and spin the alternator rapidly, and the loads should function. If you have a second alternator, modify it as you modified the first one, connecting five of your own wires to the field brushes and stator line terminals, respectively. 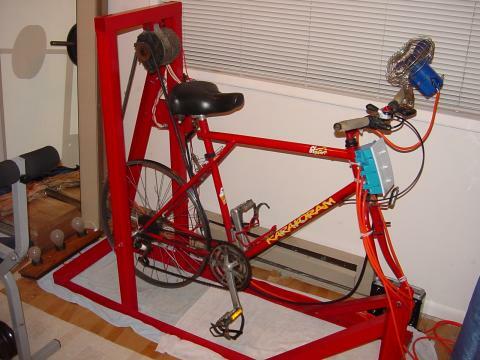 You can then use it as a three-phase motor, powered by the first alternator. Spin the generator shaft while watching the motor shaft's rotation. Try reversing any two of the three-phase line connections between the two units and spin the generator again. What is different this time? Connect the field wires of the motor unit to the a 6 volt battery (you may parallel-connect this field with the field of the generator unit, across the same battery terminals, if the battery is strong enough to deliver the several amps of current both coils will draw together). This will magnetize the rotor of the motor. Try spinning the generator again and note any differences in operation. 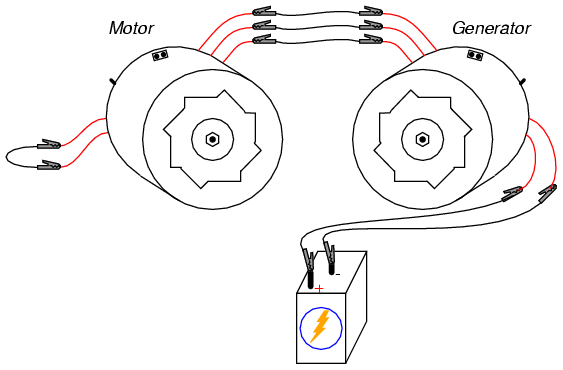 In the first motor setup, where the field wires were simple shorted together, the motor was functioning as an induction motor. In the second setup, where the motor's rotor was magnetized, it functioned as a synchronous motor. You can see a bank of three 12-volt "RV" light bulbs behind the bicycle unit (in the lower-left corner of the photograph), which I use for a load when riding the bicycle as an exercise machine. A set of three switches is mounted at the front of the bicycle, where I can turn loads on and off while riding. By rectifying the three-phase AC power produced, it is possible to have the alternator power its own field coil with DC voltage, eliminating the need for a battery. However, some independent source of DC voltage will still be necessary for start-up, as the field coil must be energized before any AC power can be produced. I recommend ceramic disk capacitors, because they are insensitive to polarity (non-polarized), inexpensive, and durable. Avoid capacitors with any kind of polarity marking, as these will be destroyed when powered by AC! Lessons In Electric Circuits, Volume 2, chapter 4: "Reactance and Impedance -- Capacitive"
Build the circuit and measure voltage drops across each component with an AC voltmeter. Measure total (supply) voltage with the same voltmeter. You will discover that the voltage drops do not add up to equal the total voltage. This is due to phase shifts in the circuit: voltage dropped across the capacitors is out-of-phase with voltage dropped across the resistors, and thus the voltage drop figures do not add up as one might expect. Taking phase angle into consideration, they do add up to equal the total, but a voltmeter doesn't provide phase angle measurements, only amplitude. Try measuring voltage dropped across both resistors at once. This voltage drop will equal the sum of the voltage drops measured across each resistor separately. This tells you that both the resistors' voltage drop waveforms are in-phase with each other, since they add simply and directly. Measure voltage dropped across both capacitors at once. 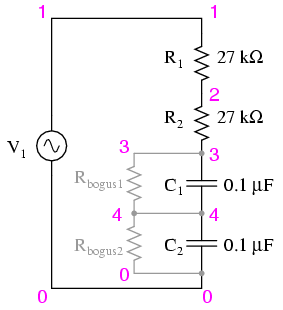 This voltage drop, like the drop measured across the two resistors, will equal the sum of the voltage drops measured across each capacitor separately. Likewise, this tells you that both the capacitors' voltage drop waveforms are in-phase with each other. Given that the power supply frequency is 60 Hz (household power frequency in the United States), calculate impedances for all components and determine all voltage drops using Ohm's Law (E=IZ ; I=E/Z ; Z=E/I). The polar magnitudes of the results should closely agree with your voltmeter readings. 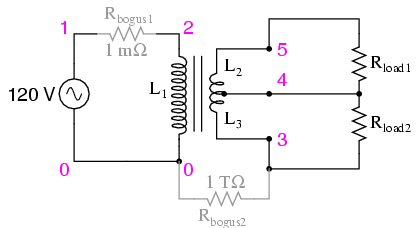 The two large-value resistors Rbogus1 and Rbogus1 are connected across the capacitors to provide a DC path to ground in order that SPICE will work. This is a "fix" for one of SPICE's quirks, to avoid it from seeing the capacitors as open circuits in its analysis. These two resistors are entirely unnecessary in the real circuit. Large, low-frequency ("woofer") speakers are most appropriate for this experiment. For optimum results, the speakers should be identical and mounted in enclosures. 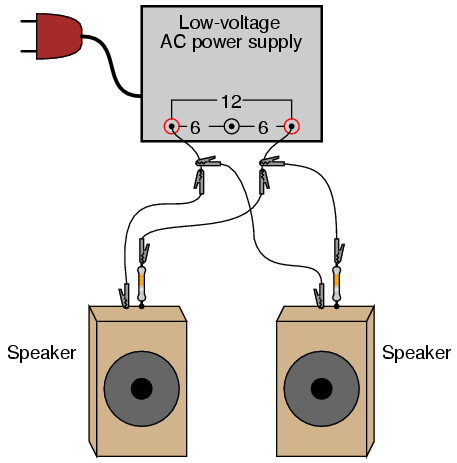 Connect each speaker to the low-voltage AC power supply through a 220 Ω resistor. The resistor limits the amount of power delivered to each speaker by the power supply. A low-pitched, 60-Hertz tone should be heard from the speakers. If the tone sounds too loud, use higher-value resistors. 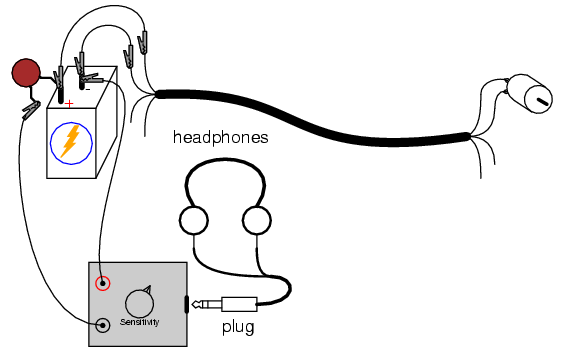 With both speakers connected and producing sound, position them so that they are only a foot or two away, facing toward each other. Listen to the volume of the 60-Hertz tone. Now, reverse the connections (the "polarity") of just one of the speakers and note the volume again. Try switching the polarity of one speaker back and forth from original to reversed, comparing volume levels each way. What do you notice? 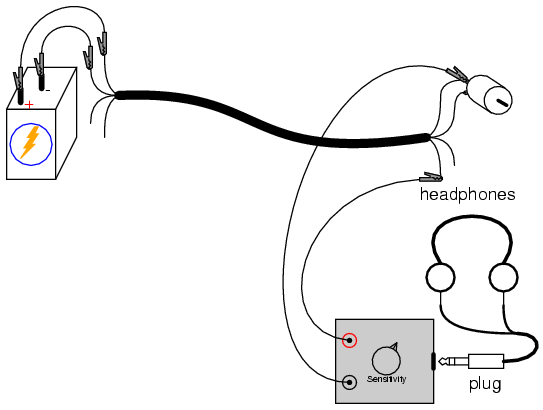 By reversing wire connections to one speaker, you are reversing the phase of that speaker's sound wave in reference to the other speaker. In one mode, the sound waves will reinforce one another for a strong volume. In the other mode, the sound waves will destructively interfere, resulting in diminished volume. This phenomenon is common to all wave events: sound waves, electrical signals (voltage "waves"), waves in water, and even light waves! 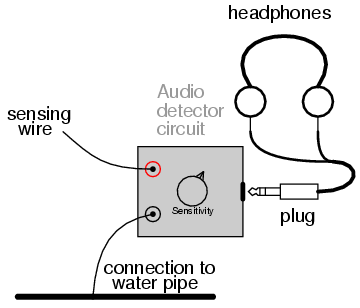 Multiple speakers in a stereo sound system must be properly "phased" so that their respective sound waves don't cancel each other, leaving less total sound level for the listener(s) to hear. So, even in an AC system where there really is no such thing as constant "polarity," the sequence of wire connections may make a significant difference in system performance. 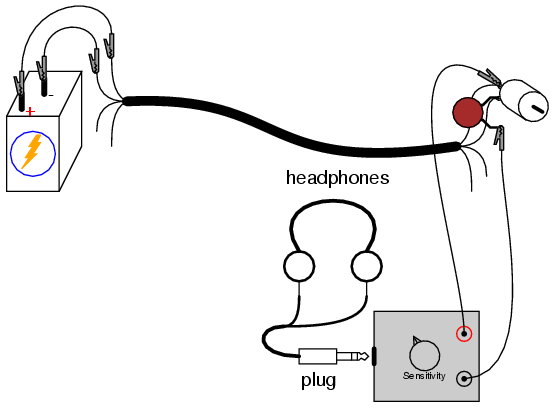 This principle of volume reduction by destructive interference may be exploited for noise cancellation. Such systems sample the waveform of the ambient noise, then produce an identical sound signal 180o out of phase with the noise. When the two sound signals meet, they cancel each other out, ideally eliminating all the noise. As one might guess, this is much easier accomplished with noise sources of steady frequency and amplitude. Cancellation of random, broad-spectrum noise is very difficult, as some sort of signal-processing circuit must sample the noise and generate precisely the right amount of cancellation sound at just the right time in order to be effective. 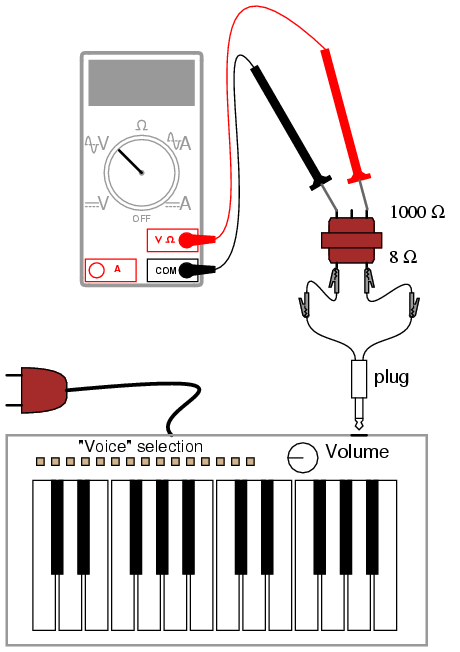 In this experiment, you'll learn how to use an electronic musical keyboard as a source of variable-frequency AC voltage signals. You need not purchase an expensive keyboard for this -- but one with at least a few dozen "voice" selections (piano, flute, harp, etc.) would be good. The "mono" plug will be plugged into the headphone jack of the musical keyboard, so get a plug that's the correct size for the keyboard. The "impedance matching transformer" is a small-size transformer easily obtained from an electronics supply store. One may be scavenged from a small, junk radio: it connects between the speaker and the circuit board (amplifier), so is easily identifiable by location. The primary winding is rated in ohms of impedance (1000 Ω), and is usually center-tapped. The secondary winding is 8 Ω and not center-tapped. These impedance figures are not the same as DC resistance, so don't expect to read 1000 Ω and 8 Ω with your ohmmeter -- however, the 1000 Ω winding will read more resistance than the 8 Ω winding, because it has more turns. If such a transformer cannot be obtained for the experiment, a regular 120V/6V step-down power transformer works fairly well, too. Normally, a student of electronics in a school would have access to a device called a signal generator, or function generator, used to make variable-frequency voltage waveforms to power AC circuits. An inexpensive electronic keyboard is a cheaper alternative to a regular signal generator, and provides features that most signal generators cannot match, such as producing mixed-frequency waves. To "tap in" to the AC voltage produced by the keyboard, you'll need to insert a plug into the headphone jack (sometimes just labeled "phone" on the keyboard) complete with two wires for connection to circuits of your own design. When you insert the plug into the jack, the normal speaker built in to the keyboard will be disconnected (assuming the keyboard is equipped with one), and the signal that used to power that speaker will be available at the plug wires. In this particular experiment, I recommend using the keyboard to power the 8 Ω side of an audio "output" transformer to step up voltage to a higher level. If using a power transformer instead of an audio output transformer, connect the keyboard to the low-voltage winding so that it operates as a step-up device. Keyboards produce very low voltage signals, so there is no shock hazard in this experiment. Using an inexpensive Yamaha keyboard, I have found that the "panflute" voice setting produces the truest sine-wave waveform. This waveform, or something close to it (flute, for example), is recommended to start experimenting with since it is relatively free of harmonics (many waveforms mixed together, of integer-multiple frequency). Being composed of just one frequency, it is a less complex waveform for your multimeter to measure. Make sure the keyboard is set to a mode where the note will be sustained as any key is held down -- otherwise, the amplitude (voltage) of the waveform will be constantly changing (high when the key is first pressed, then decaying rapidly to zero). Using an AC voltmeter, read the voltage direct from the headphone plug. Then, read the voltage as stepped up by the transformer, noting the step ratio. If your multimeter has a "frequency" function, use it to measure the frequency of the waveform produced by the keyboard. Try different notes on the keyboard and record their frequencies. Do you notice a pattern in frequency as you activate different notes, especially keys that are similar to each other (notice the 12-key black-and-white pattern repeated on the keyboard from left to right)? If you don't mind making marks on your keyboard, write the frequencies in Hertz in black ink on the white keys, near the tops where fingers are less likely to rub the numbers off. Ideally, there should be no change in signal amplitude (voltage) as different frequencies (notes on the keyboard) are tried. If you adjust the volume up and down, you should discover that changes in amplitude should have little or no impact on frequency measurement. Amplitude and frequency are two completely independent aspects of an AC signal. Try connecting the keyboard output to a 10 kΩ load resistance (through the headphone plug), and measure AC current with your multimeter. If your multimeter has a frequency function, you can measure the frequency of this current as well. It should be the same as for the voltage for any given note (keyboard key). The Winscope program I've used was written by Dr. Constantin Zeldovich, for free personal and academic use. 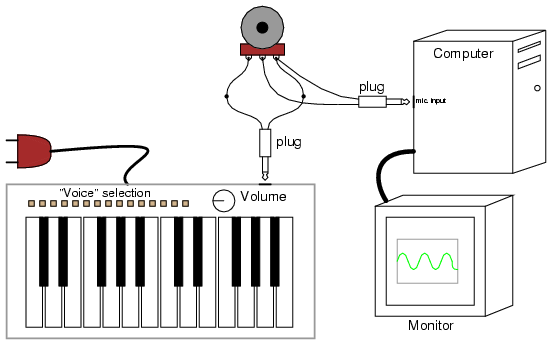 It plots waveforms on the computer screen in response to AC voltage signals interpreted by the sound card microphone input. A similar program, called Oscope, is made for the Linux operating system. If you don't have access to either software, you may use the "sound recorder" utility that comes stock with most versions of Microsoft Windows to display crude waveshapes. The oscilloscope is an indispensable test instrument for the electronics student and professional. No serious electronics lab should be without one (or two!). Unfortunately, commercial oscilloscopes tend to be expensive, and it is almost impossible to design and build your own without another oscilloscope to troubleshoot it! 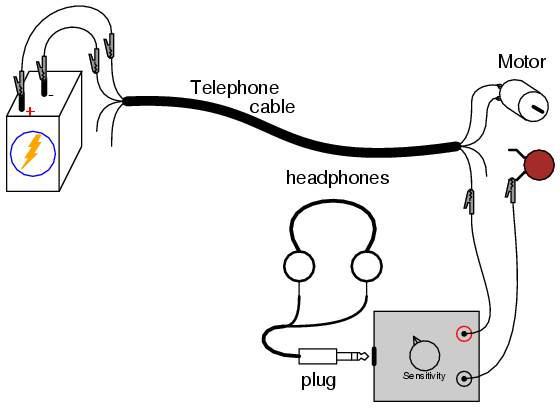 However, the sound card of a personal computer is capable of "digitizing" low-voltage AC signals from a range of a few hundred Hertz to several thousand Hertz with respectable resolution, and free software is available for displaying these signals in oscilloscope form on the computer screen. Since most people either have a personal computer or can obtain one for less cost than an oscilloscope, this becomes a viable alternative for the experimenter on a budget. One word of caution: you can cause significant hardware damage to your computer if signals of excessive voltage are connected to the sound card's microphone input! 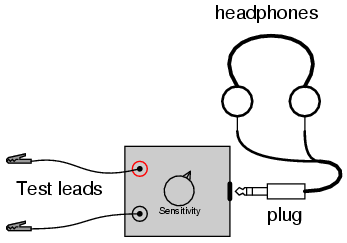 The AC voltages produced by a musical keyboard are too low to cause damage to your computer through the sound card, but other voltage sources might be hazardous to your computer's health. Use this "oscilloscope" at your own risk! Using the keyboard and plug arrangement described in the previous experiment, connect the keyboard output to the outer terminals of a 10 kΩ potentiometer. Solder two wires to the connection points on the sound card microphone input plug, so that you have a set of "test leads" for the "oscilloscope." Connect these test leads to the potentiometer: between the middle terminal (the wiper) and either of the outer terminals. Start the Winscope program and click on the "arrow" icon in the upper-left corner (it looks like the "play" arrow seen on tape player and CD player control buttons). If you press a key on the musical keyboard, you should see some kind of waveform displayed on the screen. Choose the "panflute" or some other flute-like voice on the musical keyboard for the best sine-wave shape. If the computer displays a waveform that looks kind of like a square wave, you need to adjust the potentiometer for a lower-amplitude signal. Almost any waveshape will be "clipped" to look like a square wave if it exceeds the amplitude limit of the sound card. Test different instrument "voices" on the musical keyboard and note the different waveshapes. Note how complex some of the waveshapes are, compared to the panflute voice. Experiment with the different controls in the Winscope window, noting how they change the appearance of the waveform. As a test instrument, this "oscilloscope" is quite poor. It has almost no capability to make precision measurements of voltage, although its frequency precision is surprisingly good. It is very limited in the ranges of voltage and frequency it can display, relegating it to the analysis of low- and mid-range audio tones. I have had very little success getting the "oscilloscope" to display good square waves, presumably because of its limited frequency response. Also, the coupling capacitor found in sound card microphone input circuits prevents it from measuring DC voltage: it is as though the "AC coupling" feature of a normal oscilloscope were stuck "on." Despite these shortcomings, it is useful as a demonstration tool, and for initial explorations into waveform analysis for the beginning student of electronics. For those who are interested, there are several professional-quality oscilloscope adapter devices manufactured for personal computers whose performance is far beyond that of a sound card, and they are typically sold at less cost than a complete stand-alone oscilloscope (around $400, year 2002). Radio Shack sells one made by Velleman, catalog # 910-3914. Having a computer serve as the display medium brings many advantages, not the least of which is the ability to easily store waveform pictures as digital files. 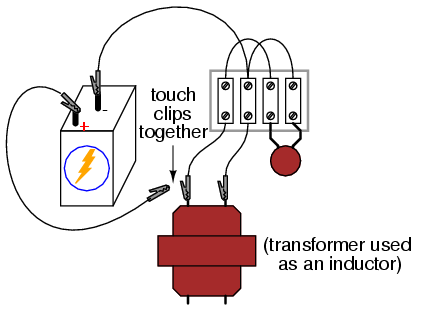 The power transformer is used simply as an inductor, with only one winding connected. The unused winding should be left open. 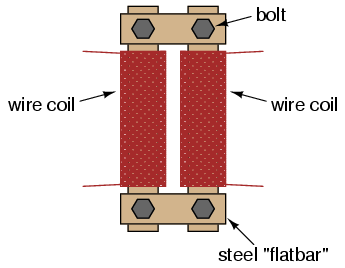 A simple iron core, single-winding inductor (sometimes known as a choke) may also be used, but such inductors are more difficult to obtain than power transformers. Lessons In Electric Circuits, Volume 2, chapter 6: "Resonance"
If an inductor and a capacitor are connected in parallel with each other, and then briefly energized by connection to a DC voltage source, oscillations will ensue as energy is exchanged from the capacitor to inductor and vice versa. These oscillations may be viewed with an oscilloscope connected in parallel with the inductor/capacitor circuit. Parallel inductor/capacitor circuits are commonly known as tank circuits. Important note: I recommend against using a PC/sound card as an oscilloscope for this experiment, because very high voltages can be generated by the inductor when the battery is disconnected (inductive "kickback"). These high voltages will surely damage the sound card's input, and perhaps other portions of the computer as well. Many small power transformers have primary (120 volt) winding inductances of approximately 1 H. Use this figure as a rough estimate of inductance for your circuit to calculate expected oscillation frequency. Ideally, the oscillations produced by a tank circuit continue indefinitely. Realistically, oscillations will decay in amplitude over the course of several cycles due to the resistive and magnetic losses of the inductor. Inductors with a high "Q" rating will, of course, produce longer-lasting oscillations than low-Q inductors. Try changing capacitor values and noting the effect on oscillation frequency. You might notice changes in the duration of oscillations as well, due to capacitor size. Since you know how to calculate resonant frequency from inductance and capacitance, can you figure out a way to calculate inductor inductance from known values of circuit capacitance (as measured by a capacitance meter) and resonant frequency (as measured by an oscilloscope)? Resistance may be intentionally added to the circuit -- either in series or parallel -- for the express purpose of dampening oscillations. This effect of resistance dampening tank circuit oscillation is known as antiresonance. It is analogous to the action of a shock absorber in dampening the bouncing of a car after striking a bump in the road. Rstray is placed in the circuit to dampen oscillations and produce a more realistic simulation. A lower Rstray value causes longer-lived oscillations because less energy is dissipated. Eliminating this resistor from the circuit results in endless oscillation.